New Horizons is nearly 2.7 billion miles (nearly 4.3 billion kilometers) from Earth, speeding away from the sun at 32,950 miles per hour. At that distance – about 29 times the distance between Earth and the sun – a radio signal from Earth needs 3 hours, 58 minutes to reach New Horizons. Since launch on Jan. 19, 2006, New Horizons has covered 90 percent of a voyage that culminates with a six-month, January-to-July encounter that includes closest approach to Pluto on July 14, 2015. New Horizons’ annual checkout – its eighth since launch in 2006 and last before next year’s rendezvous with Pluto – kicks off this week with some onboard subsystem housekeeping and navigation-tracking tasks. But the pace picks up soon enough with a slate of operations that carries through most of the summer. Early on June 15, flight controllers at the Johns Hopkins Applied Physics Laboratory in Laurel, Maryland, configured their ground systems to receive telemetry from the spacecraft as it transitioned out of its low-activity hibernation mode, where it had been since mid-January. They, along with NASA Deep Space Network operators and other team members, monitored New Horizons for most of the day to verify that all systems were normal. “New Horizons is healthy and ready for its last summertime workout before the Pluto encounter, nearly three billion miles from home,” says Alice Bowman, mission operations manager at APL. Over the next few days the team will transmit more commands through the DSN – NASA’s worldwide network of large-antenna stations – to configure New Horizons for the checkout. 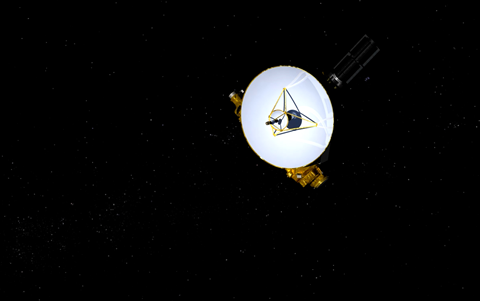 Initial activity ranges from refreshing the processors on the spacecraft’s computers, to testing the sun sensors New Horizons uses to automatically determine its position in space, to enabling the small thrusters that position New Horizons for observations and other operations. Additionally, over four intense days in late June, the final planned version of the autonomy software that guides collection of and protects the data collected during Pluto close approach will be uploaded into the spacecraft’s memory. Over the next 11 weeks, among other activities, the team will check out the spacecraft’s primary and backup operating systems as well as all seven scientific instruments – the instruments will also be calibrated and set to gather “cruise science” data that includes a distant examination of the surfaces of Pluto and its moons. The LORRI camera will also be used to carry out the first optical navigation campaign – snapping images that will help the team home in on Pluto – and the navigation team will track the spacecraft to refine its orbit. A trajectory correction maneuver is tentatively scheduled for July 15 – if needed – to keep New Horizons on a straight path toward the Pluto system. New Horizons will cross the orbit of Neptune on Aug. 25. – exactly 25 years after Voyager 2 encountered the gas giant planet – and re-enter hibernation on Aug. 29.